Eurotech is adding a new order picking system to its product range to tackle the challenge of batch size 1. The advanced system picks items from multiple pallet positions and places them on a single customer pallet. It offers increased security and efficiency while protecting the health of employees. Eurotech is launching a new order picking system in response to continuously changing market requirements. 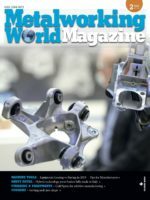 Customers are increasingly calling for individual production and faster deliveries; production and storage departments have to keep up with their demands. Orders of ever-smaller batch sizes require efficient, cost-saving production and storage management. 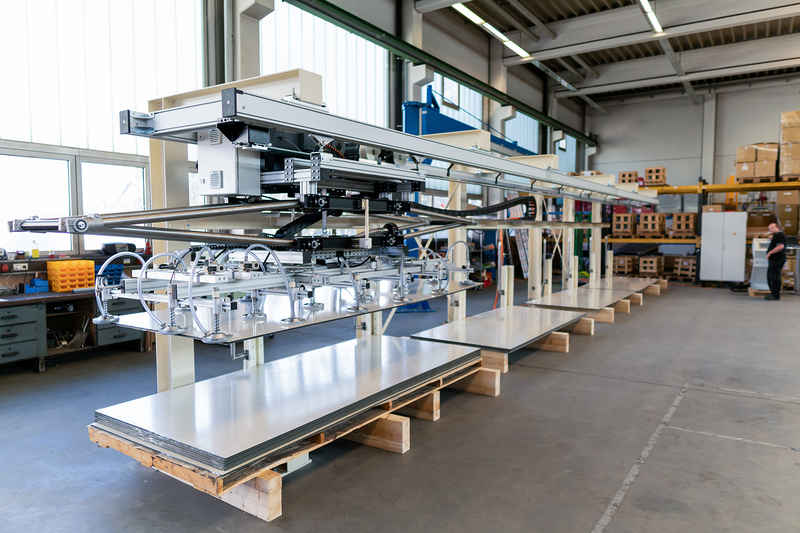 To tackle these issues, Eurotech develops customer-specific order picking systems for handling panels and other large, flat products of various formats and surfaces. Hand-picking large, flat items requires multiple employees. A fully automatic order picking system, on the other hand, offers greater efficiency and safety while protecting the quality of the products. Employees no longer have to carry out the hard physical work involved in hand-picking. This prevents health risks. Employees endure less strain on their backs and avoid accidents. Eurotech offers comprehensive picking solutions developed under the same roof: its entire development, production, assembly and commissioning processes are carried out to customer requirements. The system consists of multiple pallet positions. A trolley with a vacuum lifting frame picks up the goods from prepared pallets and deposits them on the customer pallet. An employee operates the user interface of the system to specify source and target stations and picking volumes. To start its fully automated picking cycle, the machine requires information about which vacuum circuits to activate for the different loads. These data are stored in a database or a bar code. Picking then takes place fully automatically. The system is equipped with multiple sensors to prevent errors. 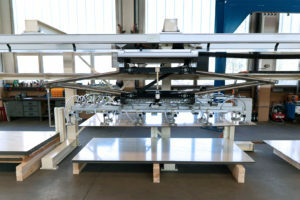 For instance, it compares the weight of the panel to be lifted with previously registered data; if the weight is a match, the machine carries out its cycle. If there are deviations between the source and target weight, the cycle is interrupted, and the machine produces an error notification. Adhesion is a common problem in handling large, flat loads such as panels. It refers to a physical state in which two surfaces attach to each other and become difficult to separate. The solution: separating the loads at the corners. This involves the use of bellow suction cups at the corners of the vacuum lifting frame. The new order picking machine can be integrated into an existing cantilever rack system. As Eurotech carries out all development and production steps in house, it can cater to individual customer requirements. 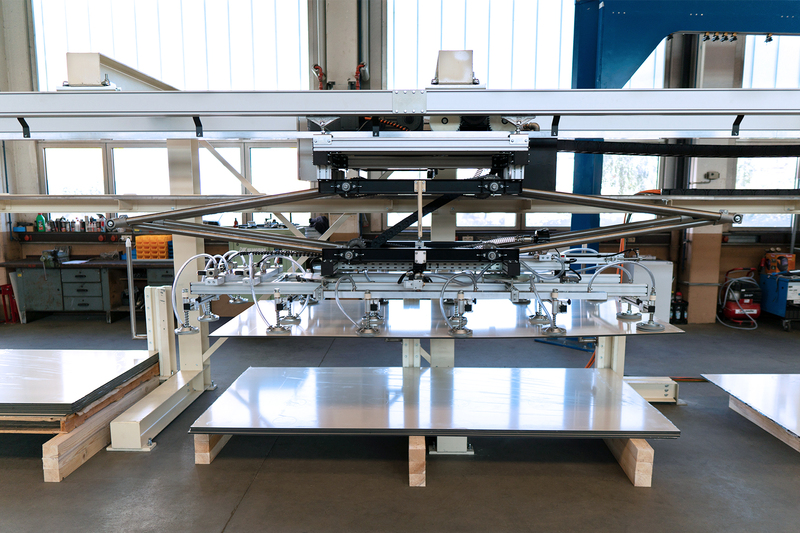 At an expansion stage of the order picking system, a floating vacuum lifting frame can make up for misalignments of up to 50 millimetres, helping customers to create well-aligned, tidy stacks. Integrated linear actuators adjust the position of the floating vacuum lifting frame using the corresponding edge. This achieves results with a maximal misalignment of two millimetres. The precise alignment and stacking of loads protects sensitive surfaces. With the fully automatic order picking system, users can effectively pick small and single-unit batches. It also eases the physical work involved and creates safer, more pleasant conditions for employees. Eurotech has already designed efficient, customised order picking solutions for several renowned customers. Multiple security and warning systems designed in accordance with DIN EN 45014 prevent operation errors and hazards.